The cheeks are often the best part of an animal; besides pig cheeks, think ox cheeks and even cod or monkfish cheeks. The hardest-working parts of an animal are always the tastiest, and as pigs spend their days chomping, their cheeks have a pretty decent workout. Szechuan pepper adds an addictive heat and tingly sensation that works brilliantly with the smoky pork. I serve these really simply, roughly torn into chunks with a dollop of homemade plum ketchup for dipping. Sticky finger food at its finest. You will need a large handful of wood chips (see page 12), soaked in warm water for 30 minutes. 1. Preheat the barbecue or smoker for indirect grilling (see page 11). Lay the pig cheeks in a foil tray. Pound the Szechuan peppercorns with the salt and paprika to a fine powder with a pestle and mortar. Sprinkle over the pork in an even layer, ensuring that each piece is coated in the rub. Set the tray on the grill, close the lid and cook for an hour. Combine the apple juice and vinegar in a spray bottle, give the cheeks a good spritz then cook for a further hour. 2. Remove the tray from the barbecue or smoker, cover tightly with foil and return to the barbecue or smoker for a further hour. Meanwhile, make the plum ketchup. Combine all the ingredients in a heavy-based pan and bring to the boil. Reduce to a simmer and cook for an hour, stirring occasionally, until the fruit has broken down and the mixture is thick and jammy. Remove from the heat, retrieve the star anise and cinnamon stick and leave to cool. 3. Pour the plum mixture into a liquidiser and blend until smooth. This makes more than you’ll need for this recipe, so pour any leftover ketchup into a sterilised jar or bottle, seal and keep in the fridge for up to 2 months. 4. Remove the pork from the heat and leave to rest for 10 minutes, then tear into chunks and serve with the plum ketchup. 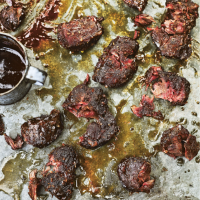 TIP: I’m not a big fan of cheats and shortcuts when it comes to cooking, but here’s one of my very few exceptions to the rule: if you’re cooking for a small group, or just short on time, you can use pig cheeks for my Pulled Pork recipe (page 142).